A pleasant sail by prahu from Sanur or Benoa, carries you to Serangan, an island just off the coast south of Sanur, nicknamed "The Turtle Island" for the large sea turtles caught there and fattened on sea grass until they are sold as the speciality of village feasts. At low tide it is possible to walk there. The island's sea temple, Pura Sakenan, is held sacred by all the people of South Bali, especially those of the Denpasar and Mengwi areas. It is associated with the 16th-century priest Nirartha. Within both this temple and the nearby Pura Susunan Wadon are slender pyramidal shrines called prasada or candi, which are rare in Bali. Over a three-day period, once every six months, thousands of devotees cross over the sandbanks. 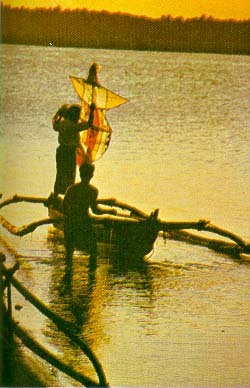 Towering giant puppets - Barong Laridung - are carried by canoe in a water procession from the mainland. Gamelans ring throughout the day, amidst the steady flow of women beating offerings to be blessed.